Decorative Concrete is a rapidly growing market, stamped concrete and overlays are becoming ever more popular while acid staining has quickly become the finish of choice for many commercial projects. We at Tablerock Asphalt. are confident you will be satisfied with our products, and our customer support. Stamped Concrete is the process of adding texture and color to concrete to make it resemble natural stone, brick , slate, and other natural products found in nature including wood, fossils, shells and many more. This limitless array of possibilities combined with great durability and lower cost than natural products makes Stamped Concrete an easy choice for new construction and renovation projects. 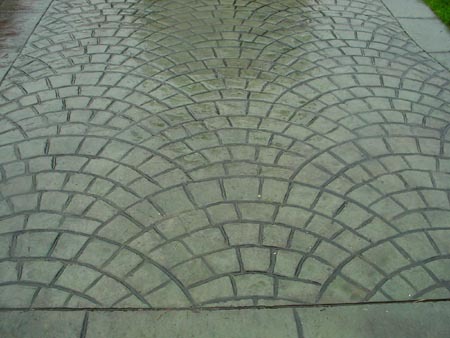 Stamped concrete can be part of a stunning entry way to a residence. In some cases the entry or front porch is built larger than normal to create places to sit or gather to talk. Steps can be stamped concrete and raised flowerbeds can be tooled to match the flatworks stamped pattern. Colors and patterns for stamped concrete are often chosen to blend with other stone or tile elements at the residence. Complex designs incorporating steps, courtyards, and fountains can be achieved. Stamped concrete can also be blended with other decorative concrete elements such as exposed aggregate finishes and acid-etch staining. In the early 1950’s, the F.D. Davis Company introduced contractors in Southern California to the idea of adding synthetic iron oxide, at the time a waste product from chemical manufacturing, to their gray concrete mix. By adding this colored powder to traditional gray concrete, it became possible to achieve a wide range of earth tone colors. Fast-forward fifty years, where in 2004 more than 204 million pounds of synthetic iron oxide were used to color cement-based products in North America alone. While we may not repeat that kind of growth over the next fifty years, decorative concrete is forecasted to continue to lead all other segments of concrete construction in growth well into the future. Since iron oxide pigments are used in most every decorative concrete product, and integrally colored concrete is in itself the largest decorative concrete market segment, doesn’t it make sense to take some time to understand this popular and key building block of our industry?